Keep your bathroom essentials organized with our Shave Kit. 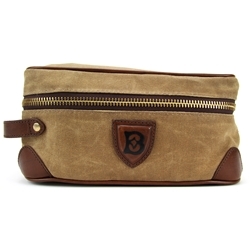 This kit features 14oz waxed canvas, full grain genuine leather, YKK brass zippers, and a spacious, lined interior compartment with a pocket for small item storage. This bag is flexible for easier packing.